Coriander vs. cilantro—which is healthier? Coriander is widely used in many different cuisines all over the world, particularly in Indian, Latin, and African dishes. Coriander—or Coriandrum sativum—is a member of the Apiaceae or parsley family. You may see it listed as an ingredient in recipes as coriander leaves (cilantro), coriander oil, or coriander seeds. Coriander is used as a spice to flavor food, cosmetics, and tobacco products. It has also been used as a medicinal aid for centuries. Coriander is sometimes used to treat stomach ailments including nausea, diarrhea, flatulence, and irritable bowel syndrome. It may also be used to stimulate the appetite or as an aphrodisiac and even as an antibiotic. However, there is insufficient evidence to support these uses. Coriander is also taken by some people to relieve constipation. Coriander is one of many ingredients in certain teas (such as Smooth Move) that have been shown to increase bowel movements. But it is unclear how much coriander alone contributes to the benefit. There is also some growing evidence that coriander may help in the management of diabetes. However, most of the studies conducted so far have been completed on rodents, so researchers are unsure if the benefits will transfer to humans. One teaspoon of coriander seeds provides approximately 5 calories, 1 carbohydrate (mostly in the form of fiber), and less than 1 gram of protein and fat. The spice will boost your calcium intake slightly (12.4 mg) and also contribute to your potassium intake (22.2 mg). There is also a small amount of magnesium (5.8 mg) and phosphorus (7.2 mg) in a teaspoon of the spice. If you use fresh coriander leaves (cilantro) in your cooking you are likely to use more of it. But it still won't add many calories or nutrient to your daily diet. There is less than 1 calorie in a quarter cup of cilantro and less than a single gram of carbohydrate, protein, or fat. Fresh cilantro (or coriander leaves) should be purchased at the peak of freshness. Leaves should be bright green and not wilted. Once you get it home, store it in the refrigerator where it should stay fresh for about a week. If you purchase coriander in seed or ground form, it should be kept in an airtight container and stored in a cool dry place, such as your pantry. The spice should stay fresh for two to three years. When coriander is used as a spice to season your food it is considered GRAS (generally recognized as safe) by the U.S. Food and Drug Administration. It is possible, however, to have an allergic reaction to certain spices, including coriander. Symptoms may be mild (such as a skin rash, redness, or swelling) or can be severe, including anaphylaxis. If you are concerned that you may be allergic to coriander, seek medical attention. Additionally, pregnant women or breastfeeding, who have low blood pressure, diabetes, or are within two weeks before surgery should check with a health care provider before using coriander. Coriander may interfere with certain medications including medications for high blood pressure, diabetes, drugs that increase photosensitivity, or sedative medications. Check with your health care provider before using coriander if you take one of these drugs. Is coriander a spice or an herb? Technically it is both. The term "herb" generally refers to the leafy green part of a plant. Coriander leaves are also commonly used in recipes and are commonly found in the produce section of the supermarket labeled as cilantro. Spices usually come from the seeds or bark of a plant and may be used in ground or whole form. 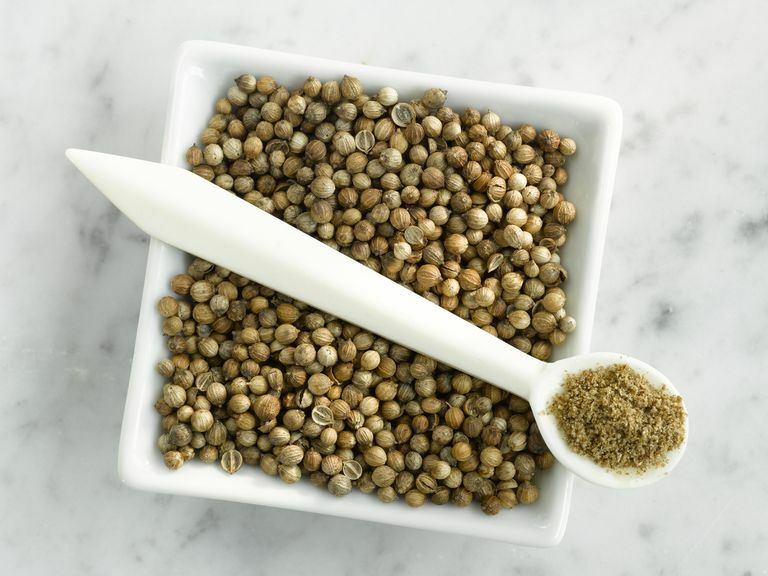 You'll find coriander seeds and ground coriander in the spice section of your local market. What's the difference between coriander and cilantro? In many parts of the world, the leaves of the Coriandrum sativum plant are referred to as coriander leaves. But in the United States, we generally call the leaves "cilantro." Both coriander leaves and cilantro are the same thing; they provide the same nutritional and health benefits. Can you use coriander and cilantro interchangeably? No. The taste of cilantro and the taste of coriander are quite different because coriander seeds are usually toasted before they are ground or used in recipes. Coriander is often described as having a nutty, floral, citrusy taste. Cilantro, on the other hand, is often described as having a fresh, parsley-like flavor. A small segment of the population gets a soapy taste when they eat cilantro. Natural Medicines Database. Coriander. Professional Monograph and Patient Handout. Published Dec. 2017. American Academy of Allergy, Asthma, and Immunology Can Spices Cause Allergic Reactions?